First, David is being very kind. He’s been a great friend of my work, along with Ken Burns, David Granger, Frank Deford, Cathy Alter and so many others over the years. Always great to have folks like that in your camp. As a writer, I dislike being pigeon-holed. For example, some say I’m just a baseball writer. OK, I do enjoy the game and it plays well on the page, but I’ve done a nonfiction book (Summer of ’68) and a novel (Castro’s Curveball) with the sport as the backdrop and they play out very differently. In the case of Summer of ’68, I moved sports to the foreground during one of the most tumultuous periods in our nation’s history. With Curveball, the conceit was what if Fidel Castro had pursued baseball more seriously? If so, the world as we know it would have been much different. So, I think you’re keeping an eye out for those connections, places where different elements come into contact. 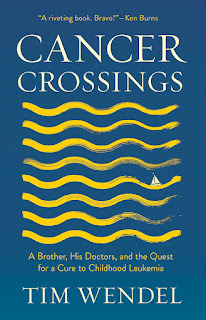 In my new book, Cancer Crossings: A Brother, His Doctors and the Quest to Cure Childhood Leukemia, I needed to find the places where the treatment of my brother Eric for leukemia intersected with the procedures and new philosophy of the so-called “cancer cowboys” – the doctors who took this form of cancer from a death sentence to a 90 percent cure rate. Once you open yourself up to such possibilities, there are many more than you realize at first. Your brother Eric was first diagnosed with leukemia in 1966, when he was three years old. And his story is a tale of miracles and also just-missed opportunities. Because his diagnosis came at the turning point from doctors seeing their duty as offering palliative care and aggressively experimenting with drug combinations to put leukemia into remission. Tell us about the prognosis then and what it would be like now for a child with his diagnosis? The odds of a child surviving acute lymphoblastic leukemia, which is the form of cancer my brother had, have been greatly improved. My daughter Sarah was at Georgetown Medical School when I began Cancer Crossings. She’s the one who pointed out that the survival rate went from 10 percent to 90 percent during the 1970s. That really turned my head and I went in search of this small group of doctors who did it. Many were in their mid to late 80s by then. And when they told me how much opposition they faced from the medical community, how they were called killers, poison pushers, misfits and, yes, cancer cowboys because they dared to try something different when it came to leukemia, well, I was hooked. I had the elements of a family memoir and a medical detective story. And with the latter, there was fierce opposition to what the cancer cowboys were trying to do. Until this point, many in the medical community refused to take on cancer. It was that daunting. But the cancer cowboys pushed ahead and many of the advances we take for granted today – chemotherapy cocktails, the blood centrifuge machine, etc. – are a result of their work. Your parents’ response to his first remission was to buy a big old sailboat for their family of six children and to not only go for sails but to sail all the way across Lake Ontario, from Buffalo to Toronto, an a Saturday and sail back home on Sunday. You wrote in Psychology Today that “We coped with my brother's struggle against leukemia by doing instead of talking.” Tell us how that seemed then and how it seems now, as a parent, looking back on your family’s response? Few things make you feel as vulnerable as becoming a parent. The core emotion is you want to protect this new being you’ve brought into the world. To realize, decades later, that my parents also dared to have family adventures, even with a kid with leukemia in tow, kind of blew my mind. My parents taught us to really live in the present. We jammed as much as we could into every day. We sailed to the far horizon on Lake Ontario, which is a huge body of water, in the summers, and skated and played hockey in the winters. They let their son with ALL play hockey? Kind of crazy isn’t it? But it all kind of worked and us kids learned so much in the process. For example, my father made sure we knew how to read the wind, to realize that it’s always changing direction and velocity. Of course, that makes you a better sailor, but it’s also a great way to look at life. In a way, Cancer Crossings focuses on my parents when they were at their best, and that’s a good thing for any kid to be reminded of. I always tell my students to be mindful of having a clock in their book, and you have many ticking time bombs in yours. Of course, there’s Eric’s illness. On the other end, a kinder clock, is your own daughter in medical school learning about those pivotal years that changed the outcome for leukemia patients. What was that like, her bringing you that discovery? I knew I needed to do right by this request. My daughter genuinely wanted to know more about my brother, his doctors, this quest to cure childhood leukemia. I guess it’s another example of how being a parent opens you. I mean I couldn’t really shrug this off. My daughter wanted to know something important about my past and it was up to me to find some of those answers. Would I have written such a personal story, with a steep learning curve for me about medical procedures and meds, without her request? Probably not. But the fact my daughter wanted to know made it very important from the get-go. Another clock is ticking with the doctors—they were racing to find treatments or even a cure and then when you decided to write the book, there’s your race to find them and interview them because they’re getting on in years. Can you talk about those two clocks—the doctors early careers and talking to them now? Time running out or running down in any work creates urgency, heightens things across the board. I hadn’t planned to have two clocks ticking, they were there, right in front of me. One was the race to cure a deadly disease before more kids died. But I soon realized that many of the cancer doctors and nurses were getting on in years, too. How much longer would they be with us? All of them were very forthcoming in our conversations because I think they knew when they passed on much of this incredible success story, the details about a modern medical miracle, would go with them. Indeed, several of the cancer cowboys died in the weeks leading up to the book’s release. My hope is some of their message lives on in these pages. 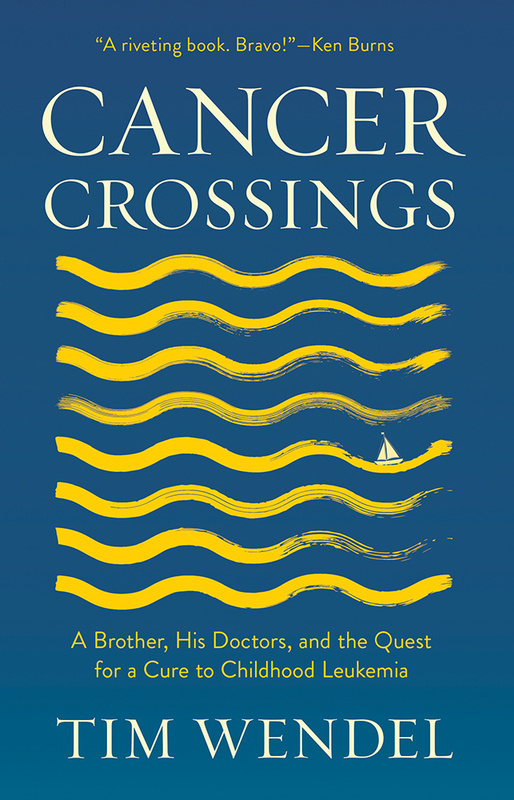 Early on in the book, you mention that Cancer Crossings is a departure for you, being a book that’s focused on medicine instead of sports. But you have written about teams overcoming obstacles and great odds. The doctors at Roswell Park certainly qualify as a group of people trying to do something that nobody thinks they can. What do you think draws you to such stories? Mary Kay Zuravleff’s latest novel, Man Alive!, was named a 2013 Notable Book by The Washington Post. Her essays and short fiction have appeared in The Atlantic, Los Angeles Review of Books, American Short Fiction, and The Washington Post. She is the founder of NoveltyDC, which offers master classes on the novel and manuscript consultation.